Fabtech is a pioneer in making Cleanrooms affordable to all, without compromising on the quality. We specialize in designing, manufacturing and supplying modular panels to construct walls andwalkable and non-walkable ceilings. Highly experienced in offering HVAC & R SERVICES to our esteem clients. The skilled professionals deliver these services with perfection and quality standard. We are highly efficient in designing HVAC & R products according to cilent's specifications and standards. Formation of unique, high quality structure is the passion that motives Silicon Engineering Consultants to be the best. The quality of structure to last long depends on various aspects; one of them is HVAC System Design. 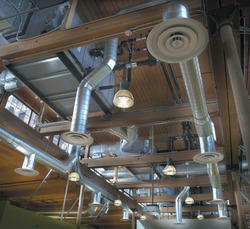 We provide HVAC System Design for Commercial Systems, Residential Systems and Industrial Systems as well. We provide consulting service for HVAC designing. We can provide you best solution according to your requirement and you can get optimum reults of HVAC services. Being a frontrunner in the industry, we are involved in providing our customers highly qualitative HVAC System Design Services. These provided services are offered in agreement with the defined guidelines to preserve our standing in the industry. To add, the employees rendering these services are appointed after stern analysis of their skills and experience. We are one of the leading firms of HVAC System , Blue Star Air Conditioner. Our products are broadly extremely used in varied places due to their top performance and longer working life. Shivam Engineering is amongst the leading HVAC solution providers in Mumbai and Maharashtra that provides comprehensive assistance pertaining to central and packaged air conditioning solutions to malls, offices, entertainment complexes, hospitals, hotels, restaurants, and retail outlets. Air Conditioning Systems for domestic & Commercial Use. We have the expertise of working in projects of different sizes, applications and processes. The HVAC Designs offered by us are highly in demand in various sectors owing to their conformation to various Indian and international standards. we offer a broad series of HVAC Validation. In addition, we offer this product at nominal rates.